It's 4 Days to go!!!! How are you all doing? I hope your week is going well? Thankfully, the heat seems to be dropping ,we thank God for today's rain, I almost stayed in bed but a girl has got to work you know! Once again, Naturals In The City is here and I'm pretty excited this time around because I'll be attending. 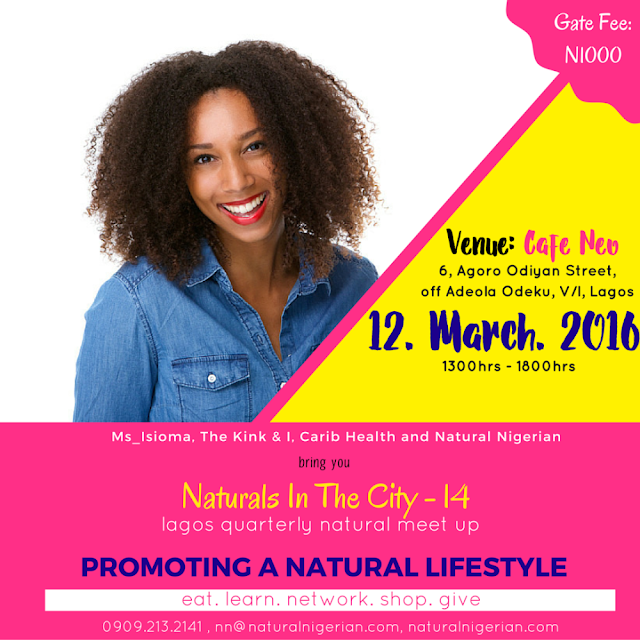 Naturals in the city is a quarterly meet-up in Lagos which aims at promoting better living and a more natural lifestyle. The event will feature experienced and knowledgeable individuals who are willing to share their wisdom in topics that would cover Hair, Nutrition, Fitness and lots more. Come and make friends, as there would be lots of networking to be done. Everyone is invited, ladies, men, natural or relaxed... everybody!!! At NITC, there would be a wide range of vendors selling your favourite hair products and accessories, natural , organic as well as proudly Nigerian made brands all at amazing prices. There would be lots to eat; Food by Kitchen Butterfly would be available as well as drinks and pastries at Cafe Neo. It promises to be fun and I look forward to seeing you beautiful dolls there. VENUE- Cafe Neo, 6 Agoro Adiyan Street, Off Adeola Odeku Street, Victoria Island, Lagos. So who is coming out on Saturday?? ?